The discovery of more than twenty spear points of about 50.000 years ago makes Teixoneres Cave (Moià, Barcelona) the archaeological site with the highest number of this kind of weapon in Catalonia. An entire cave bear skull of an adult male has been recovered at Toll Cave. This individual has been named Pyros in honour of the oldest bear known so far from the Pyrenees. An agreement between IPHES and the Moià Municipality with the objective of promoting research, teaching and outreach in the field of the Archaeology and Cultural Heritage will be signed on August 23th, 2015. 50.000 years ago, a group of Neanderthals settled at Teixoneres Cave (Moià, Barcelona) with a singular focus: hunt. 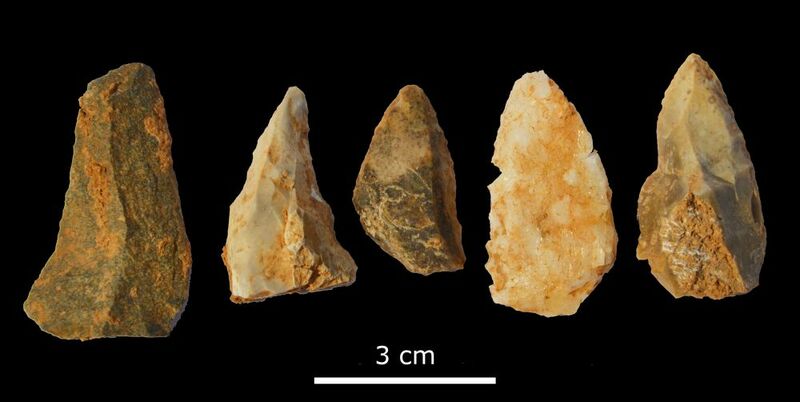 This hypothesis is corroborated by the discovery of more than twenty spear points, recovered during the ongoing archaeological season at this site under the direction of IPHES (Institut Català de Paleoecologia Humana I Evolució Social). Several of these points show diagnostic fractures typical of impacts over hard surfaces, probably over the prey bones. This discovery makes Teixoneres Cave an authentic hunting station and the Catalonian archaeological site, and probably one of the Iberian Peninsula, with the highest number of these weapons. In concomitance of the presentation of these finds an agreement has been signed between IPHES and the Moià Municipality with the objective of promoting research, teaching and outreach in the field of the Archaeology and Cultural Heritage. The diversity of Neanderthal prey, living around Teixoneres Cave about 50.000 years ago, suggests that these groups of hunter-gatherers were not focused on specific animals. In fact, remains of horses, aurochs, red deer, wild asses, roe deer, goat, chamois, rhinos and rabbits are very abundant and were found on the cave surface showing clear evidences of intensively roasting and consumption. This evidence indicates a significant change in the occupational dynamic of the cave. The previous layers pointed out that Teixoneres Cave was used as a den by large carnivores, mainly by hyenas, and occasionally by Neanderthals during their displacements through the territory. This hypothesis is supported by the archaeological record showing clear differences regarding the origin and the uses of the raw materials. The toolkit of the travelling Neanderthals was mainly composed by exogenous chert, sandstone, etc, whereas in the current level the most utilized raw material is the quartz that could be found in shape of rounded cobbles in the neighbouring of the cave. At the same time, the archaeologists also worked at Toll Cave. This site is known for having one of the best cave bears collection in the Iberian Peninsula. This year the work was focused in a layer dated about 50.000 years ago, the same chronology of the hunting camp from Teixoneres Cave. The number and the quality of the recovered finds are spectacular (around 300 remains of cave bear). Among them stand out a skull and several limb bones from an adult male, that has been named Pyros, in honour of the oldest bear known so far from the Pyrenees. These finds will contribute to understand the behaviour of these animals that many time could have competed with Neanderthals for the use of the caves. The continuity and the quality of the results of more than 10 years of research in these caves by the archaeologists from IPHES have left a significant number of scientific publications in internationals peer-review journals. The current ratio is about two publications per year consolidating this research project as one of the most productive in Catalonia. These caves are included in the projects founded by the AGAUR and Catalonian Government “Compartint l’espai: interaccions entre homínids i carnívors als Nord-est Peninsular” (Sharing space: interactions between hominids and carnivores in the northeast of the Peninsula) and “Group of analysis of socio-ecological processes, cultural changes and population dynamics in Prehistory (GAPS)” and by the project funded by the MINECO of the Spanish Government “Momentos de la vida neandertal: Patrones de comportamiento y arqueología de alta resolución” (Snapshots of Neanderthal lifestyles: Behavioural patterns and high resolution archaeology) and “Comportamiento ecosocial de los homínidos de la Sierra de Atapuerca durante el Cuaternario III” (Ecosocial behavior of the hominids of Atapuerca during the Quaternary III).